For those of us who lament the fact that all the lovely brands available in Sephora is not available in Australia, we are grateful to have a mini version known locally as Mecca Cosmetica. With over 3000 products across 70 big brands including NARS, Stila, By Terry, Kevin Aucoin and Philosophy, there's sure to be something for the beauty addict in all of us to play with and take home when browsing the beauty counters. So I was super excited to find that a new store will open in Melbourne Central in 15 days time (Oct -07). 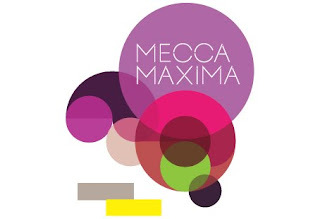 It's going to be big girls - that's why it's aptly named Mecca Maxima. What's more exciting is that if you sign up now Melbourne peeps, not only will you get the latest update of the grand opening day, you'll also receive a voucher to redeem a goody bag full of awesome samples from Mecca's best selling brands! So what are you waiting for? Jump on to it now! Haven't visited Mecca Cosmetica before? Check it out online now and check out the brands it carries. P.S - Interstate peeps, don't despair with missing out on a freebie - there's a free mini mecca polish available for you if you haven't gone to pick it up yet. It's the last week to sign up and download the voucher. I might even finally purchase the perfume I like - if they stock it.....fingers crossed.